This is probably one of my favorite unconventional “taco” recipes. 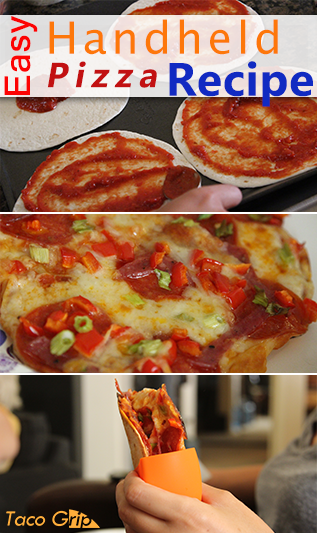 I created these handheld pizzas one night when my son really wanted pizza, but I didn’t have any pizza dough. To my surprise, this was really, really tasty (and easy to make). 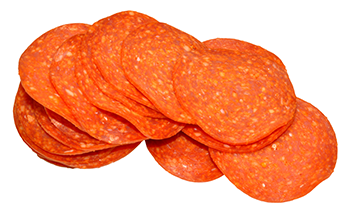 I rummaged through the fridge and pulled out some left over flour tortilla shells, marinara sauce, cheese, pepperoni, salami, and misc toppings. I thought, well here goes nothing! Step 1: Collect the necessities. Soft flour tortilla shells (corn may work, but I’m a bit skeptical. 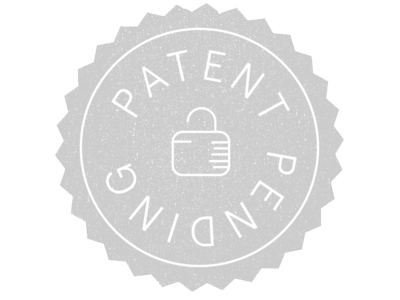 Leave me a comment if you try it and let me know what you think). Spread the tortilla shells on an ungreased cooking sheet. 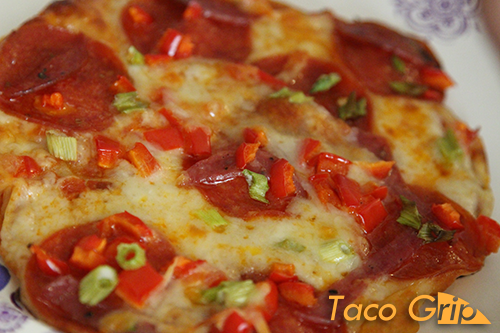 Assemble the pizza base by spreading 2-3 tablespoons of sauce over each tortilla shell. Then, top each shell with 2-3 pinches of cheese (really, you can spread as much or little as you want according to taste). If you only want cheese pizzas, then skip step 3. Place the pizzas in a pre-heated oven at 400 degrees. Bake for 20 minutes, and then peek in to see how they’re cooking. After 20 minutes, continue to check on the pizzas in 10 minute intervals until done. It took my pizzas about 45 minutes to bake. Your time may be less depending on your preferred doneness. Let the pizzas cool for about 5-10 minutes. 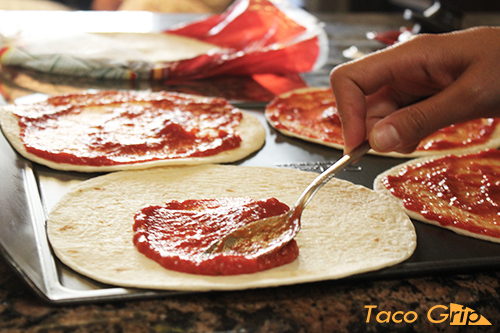 Once cool, fold the pizza in half and place it in the Taco Grip. 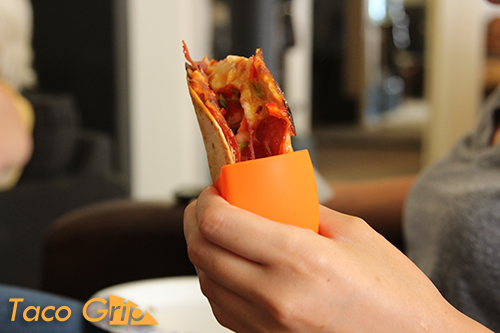 Eat vertically by resting the Taco Grip in the palm of your hand. You’ll notice A LOT of grease collect in the bottom of The Grip. This is one of the best parts of eating with the Taco Grip; you’ll get rid of a bunch of grease you would have otherwise consumed.